The test is made by emitting a signal in 2 sequences of 4 messages sent. I move a receiver over different area of my house. Some are same floor, some are one floor below and some are underground. Distance is from 2 meters to 15 meters. Different wall thin or large are on the way. I won’t detail, it is not the objective. We will name room A,B,C,D,E,F,G,H. Result will be OK when received 2 sequences have been received. KO otherwise. The second module can be found here for 6€. It is operated at 5V Vcc with a GPIO working at 3.3V. 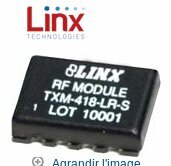 The last module tested can be found here for the price of 5.5€. It is operated at 3.3V as for Vcc and GPIO. 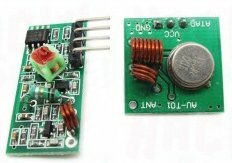 The result obtain from this component is incredible ! This entry was posted in Hardware and tagged arduino, raspberry pi, rf433. Bookmark the permalink. Have you tried this one TRM-433-LT ? It’s a transceiver with a triggering pin (that can be linked to a GPIO pin). The datasheet shows a -112 dbm sensitivity in receiving mode as for the QAM -RX1 that you have tested. No, I have not, the reason is that this product is twice expensive as the one retained so for my project i did not expect a better result for a such difference. But i use the transmiter from this brand and they have really good products. That’s OK. You are right: the result would not have been better.